We all have our own special skin concerns. Below is a list of some of the top ingredients for addressing them. Some are very in and some have been treatments for years. Alpha-hydroxy acids (AHAs) are a popular ingredient in health and beauty products. They help smooth fine lines and wrinkles, improve the texture and tone of skin and eliminate blemishes. Many anti-aging products contain alpha hydroxyl acids. Glycolic and lactic acid are the most commonly used types of alpha hydroxyl acid. Malic, citric and tartaric acids are other types of AHAs. This ingredient also exfoliates. It removes dead skin cells so that new skin cells can form. Alpha-hydroxy acids also encourage the production of collagen and elastin. I have been testing and using Instanatural for years. And I was so blessed when they sent me this glycolic line. The cream is amazing! Hydrating and remember to use SPF. And if you are not use to using glycolic products ease into it. Use them at night. Instanatural Glycolic Serum: A good overall daily Glycolic serum. Retinol is a derivative of Vitamin A. What makes this ingredient special is its tiny molecular structure. Its small structure gives it its ability to penetrate the outer layers of skin. Retinol facilitates in cell renewal. It is also an antioxidant. Retinol has several other properties that make it a popular ingredient in beauty treatments. It increases the amount of moisture in the skin and treats acne. Retinol is a common ingredient in anti-aging products and topical face treatments. I really love a daily serum and my Retin-A I get from a doctor. My holy grail of all products. Foxbrim Complete Retinol Serum A full over the counter strength retinol lotion formulated to be a least irritating as possible. (Keep reading for the giveaway)!! Foxbrim Retinol Cream The both of these are a complete system that is very affordable and work amazing on your skin. 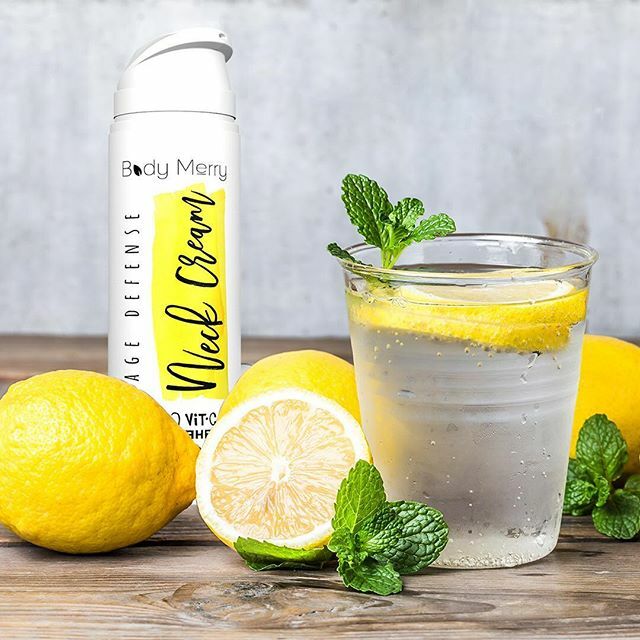 Body Merry Neck Cream Their strong formula uses effective ingredients like 4% Vitamin C, 5% Glycolic Acid, Lactic Acid and CoQ10 to revive, lift and firm your delicate neck skin that can sometimes be forgotten. Body Merry Age Defense Super 6 Serum This serum gives you 6X the benefits than other vitamin C serums by combining all the excellence of multiple serums into 1 mighty formula. C-CELL REGENERATION SERUM Their high-potent brightening serum delivers a radiant look and balance for that "glowing" complexion we all strive for. The texture and the product is beautiful. This is a new favorite. Look for my review for LaFace skincare this weekend! They are new high end company that has some amazing products. Click on their highlighted name to go to their site and here go like their page on La Face Skincare. This ingredient does several things. It stimulates collagen and elastin production and is an antioxidant. Copper peptide also enhances the body’s ability to create tissue. It is an ingredient in skin care products because it leaves the skin firm and soft. Copper peptide seems to help skin achieve these effects faster than other anti-aging products. Another advantage of copper peptides is its ability to heal scars and rid the body of any damaged elastin and collagen. A new favorite that has amazing ingredients from La Face is CRC Cream. Which helps acne scarring, hydration and wrinkles. Acne medications, shaving creams, anti-aging skin care, post-surgical and hair regeneration products all contain copper peptides. There are numerous skin care treatments on the market. Many of these products claim to achieve certain results. To know if the product will live up to its claims, it should contain the best ingredients. Buying products that contain strong and effective ingredients will ensure that people spend money on beauty products that deliver. When I am using my LED light therapy along with my Foxbrim Peptide Complex Serum and Moisturizer it is like magic to my skin. I also use it when I am microneedling. The serum sinks right in. CRC-Cellular Regeneration Cream CRC is the ULTIMATE anti-aging moisturizer that not only delivers intense hydration but addresses acne scarring, rosacea and minor irritations. This unique combination of active ingredients, RARE Swiss Apple Stem Cells, Vitis Vinifera (Grape) Seed Extract and a multitude of extremely active peptides power this ultimate day/night cream. The luxury and results will FAR exceed your expectations. It is a beautiful cream. I can't wait to see more results from this line. *Artnaturals Youth Eye Gel A blend of all natural ingredients work together to give your eyes the nutrients and moisture they need to restore their healthy youthful glow. That means less puffiness, fine lines, and dark circles. Al these skincare lines are natural, healthy and some vegan even! ( La Face) I love them all and incorporate everyone into my skincare routine when I am not testing or even when I am testing skincare lines. They work well with others. LOL. It is important to have great skincare. And acids do just that. I hope all you beauties click on the highlighted products listed here and check them all out. They are all wonderful!